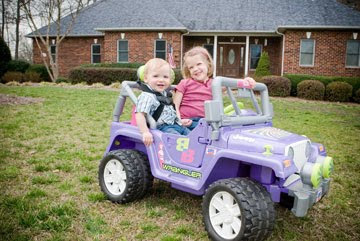 'The Jeep' Skylar received this jeep from Santa the Christmas she was 3. 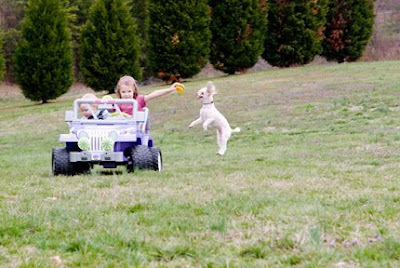 She was unsure of it for quite a while, eventually loving it, doing laps in our front yard and on to power slides. Of course now, she's too big for it. Jaden took to it early on, as you can see below. All we had to do was strap him in so those power slides wouldn't lose him. 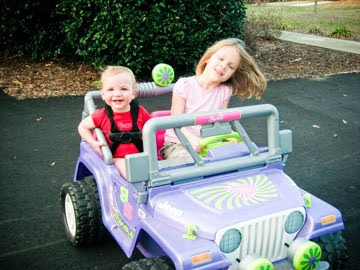 Nowadays, Skylar has outgrown it and Jaden has stepped right in. 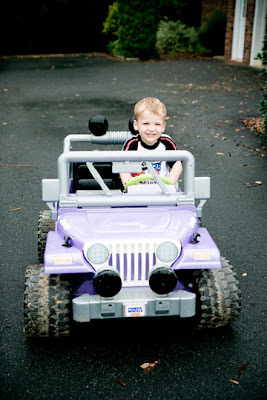 He's been driving it since he turned 2, but as a parent, I really felt bad that my boy - and all boy at that, was driving a Barbie themed jeep with a hot pink seat. 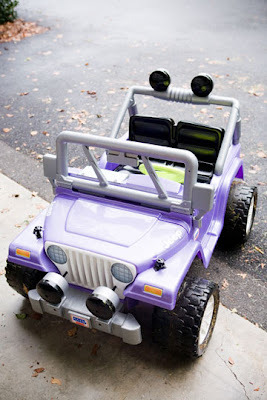 I also didn't want to shell out $300 for another Power Wheels! I brainstormed and found the time. It literally took me less than 5 minutes to peel off the Barbie stickers - that was a huge improvement. I picked up some black spray paint at Home Depot that was made for plastics and one afternoon I spray painted the seat, the round "lights", and the hood attachments. That took me less than 20 minutes. A few hours to dry and VOILA! 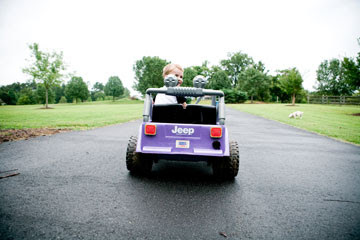 - my boys got himself a jeep of his own. He LOVES his jeep. I think it's pushed swinging out of his 'favorite thing to do' spot. He leans into his turns, finds the bumpiest route in the yard and is working on perfecting his powerslide. He also lets out tons of "yee haws" and "woo hoos" when he's doing his laps. I love watching him enjoy it so much. He's 2 1/2, it's funny how he took to this so much earlier on than his sister.